Have You Said Goodbye to Your New Year's Resolutions? If you are someone who has made a New Year's resolution and is now struggling to continue eating kale, and beet juice each morning, or going to the gym 6 times per week - you are not alone! Psychology Today reports that only 8% of people will actually achieve their New Year's resolution. Less than 1 in 10 will actually stay committed to a promise they may have made with the best of intentions to improve their life. One of the reasons why many of us shift away from these goals is that they are simply too big of a change in our lives. We may lack time, money, or the knowledge to achieve our objectives, and are too harsh with ourselves the moment we miss one day at the gym or add sugar to our coffee. 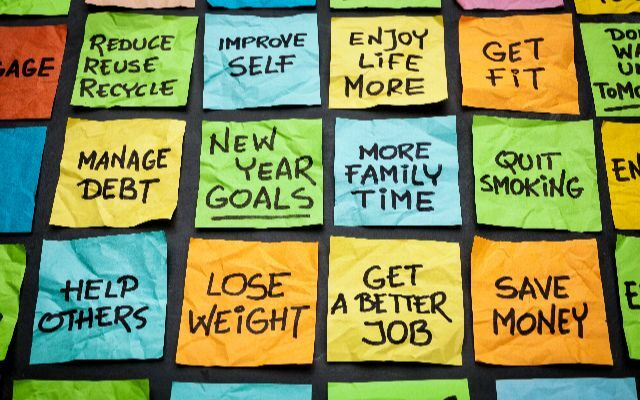 Focusing on changing one behavior at a time helps us to succeed in making our resolutions stick. Let's face it. We beat ourselves up way too much when things don't go as planned. It's important to realize that there are people in the world all too happy to point out our shortcomings and I am someone who is already pretty honest about my missteps. I have found that sharing my struggles and successes with friends and family really helps keep me focused and not overwhelmed. Having a sense of humor helps because it allows me to laugh when things don't go smoothly in life. A British researcher found that it takes 66 days to develop a new habit - not a month as many self-help books would tell you. Because of this, it is totally acceptable to skip a gym day, treat yourself to that sandwich instead of what likely feels like the 1,000th salad you have eaten in 2019. What really matters is that you hit the "reset" button the next day and continue the effort. If you are considering buying or selling a home in 2019, and you have made it one of your resolutions - now is the time. For buyers, it is important to find out what you can qualify for a mortgage, and what types homes are available in your price range. For sellers, take the leap and find out what the value of your home is - you might be surprised. Real estate resolutions involve obtaining information, so that you can make the best decision for you and your family. So...many of you might be wondering what one of my New Year's resolutions was for 2019? You may be surprised to learn that it was to connect with my clients and friends more often and share a different perspective on real estate and life. I don't profess to have the answers to life, but I love real estate and want to be there for my clients when they need me.